New Jersey psychologist is crowned the new Miss New Jersey for Royal International Pageant along with her two daughters. 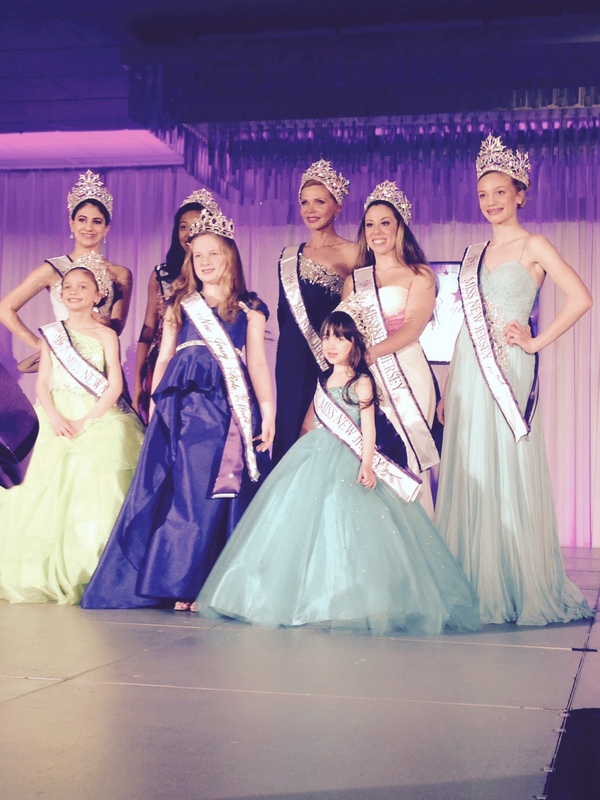 They describe pageantry as a positive experience and encourage youth to dream big and set positive goals in their platform website, http://www.ChoosePositivePath.com. It was an exciting and victorious moment for the Wilson family on Sunday March 22 when Dr. Victoria Wilson got crowned Miss New Jersey, along with her 8 year-old daughter Marjana Wilson, and 12-year-old daughter Silvana Wilson, all of whom beat out competitors in each age division. Although Ukrainian born Victoria modeled in her youth, the 42-year-old clinical psychologist competed for the first time in the Royal International Pageant, and she really enjoyed the experience, winning over much younger competitors. "My daughters have been competing in pageants for a few years now and they challenged me to do the same, so I accepted the challenge and I'm really glad I did." Despite much criticism and scorn surrounding the pageant industry, Dr. Wilson, who owns the NJ Center for Positive Psychology (http://www.centerforpositivepsychology.com), believes that pageantry, as any other type of competition, can be a truly positive experience. "There are a lot of misconceptions surrounding the pageantry, mostly due to TV shows like Toddlers and Tiaras, however, I believe the pageantry can be a self actualizing experience, depending on the kind of pageant you choose based on your child's talents. In interview based pageants which are scored on the basis of personal speech introduction, interviewing in front of the judges, and evening gown competition. These pageants emphasize grace, posture and poise, equanimity, on stage presence, and good conversational skills and interview skills. For my daughters these interview based pageants have been a great source of growth and self actualization. They have learned that it's not easy to win and that if there were no losses, they would never appreciate the rare victories. They have learned that it's important to spend their spare time practicing their walk routines and interview questions and their speeches instead of wasting time playing video games." "My younger daughter tends to be hyperactive, so she had to learn to be still and focused and not to fidget during interviews. My older daughter used to slouch and have bad posture before she began pageantry and has learned to overcome it." Many of these pageants offer optional competitions, such as speech, commercial acting, photogenic, academic achievement, and casual wear competitions, so there are many ways that one can win. "What I like about pageants is that they are about hopes, dreams, and goals. Research shows that our youth is becoming more and more lost and depressed. Children need goals, particularly teens. There is an expression 'an idle mind is the devil's workshop', that is particularly true for teens, who are naturally sensation seeking. When teens are devoid of positive goals, they tend to seek other adrenaline producing activities, which are often illegal or involve the use of controlled substances. There is a growing depression and apathy among today's youth, accounting for about 4600 adolescent suicides per year in the US, the highest in the industrialized nations. Sports and other athletic activities are the best way to involve children and teens in goal setting. Since not every girl is interested in sports, or dance, these interview based pageants provide an alternative form of competition. Positive pageantry combines all the elements that many girls enjoy, such as dress up and glamour, on stage attention, adrenaline rush of the competition, and establishing long-lasting friendships." "There is a misconception that you have to be classically beautiful to compete in pageants, which is simply not true. Pageant winners come in all shapes and sizes and most qualities which are required for winning, such as graceful walk, poise, smile, eye contact and conversational and social skills. For moms whom think that buying a pageant dress is unaffordable, there are companies that rent pageant dresses for $50. I have seen my girls best qualities truly flourish as a result of interview based pageants, and I can certainly recommend it to many moms out there who are looking for a positive hobby for them and their daughters. Ultimately it doesn't really matter whether your daughter does pageants or dance competitions or plays soccer or chess, it's about goals and dreams - really anything is better than vegetating in front of the TV screen and being consumed by the electronic media, which is so pervasive now in the adolescents world, or getting involved with kids that are negative influences or have bad or illegal habits." "To encourage your child to set goals, you need to be a positive role model, get out there and join an amateur bowling league, and take your child to practice with you, or get a yoga DVD and learn yoga together, or set a goal to hike every local mountain together. Think of something you enjoy doing and get your children involved in this family activity, whether it's fishing together, learning a new language, or making arts and crafts for the local fair. Children learn vicariously, it's not what you tell them to do but what do you do yourself that they will imitate. Don't expect your child to read if you never pick up a book yourself in front of them. Show them that you can take calculated risks, and your children will strive to do the same." Dr. Wilson realizes that many working mothers are simply too overwhelmed and tired to engage in positive hobbies with their children. Because of that she and her daughters along with two other therapists and their daughters are creating an online community of positive peers, through their non profit, http://www.choosepositivepath.com which showcases blogs and online contests based on the principles of Positive Psychology and encourages chatroom peer to peer interaction and support for depressed and anxious adolescents and teens. Their first event, called Walk the Positive Path, will take place on May 2 at Darlington Park in Mahwah NJ. Children ages 8 and up as well as adolescents and teens are encouraged to attend, and as part of the walk they will get lanyards and will receive pins with positive messages at each station of the walk, and T-shirts which they will have to get signed by at least 20 other attendees to get a prize at the end of the walk. "we're trying to get young people to meet other positive peers, get some exercise and enjoy socializing in a beautiful natural setting. Psychological research shows that part of the depression and apathy affecting today's youth has to do with a lack of sufficient exercise and contact with nature and insufficient peer support. We are trying to create all of that through http://www.choosepositivepath.com Best of all, this first event will be free to the public, due to contributions of sponsors. We are seeking further corporate and personal sponsorship for their future events. PHOTO: Marjana Wilson lower left, Victoria Wilson center, Silvana Wilson, right.